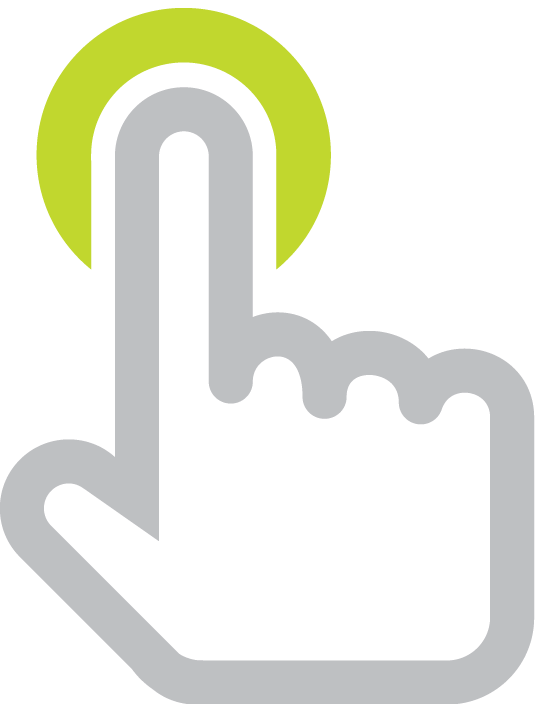 Let me tell you about websites that are great for finding clipart, photos, symbols, and icons. These sites feature images that you already have permission to use on your website, blog, poster, slideshow, video, animation, etc., etc. Also, get tips on how to download these images and advice for finding images to illustrate your ideas. This is Learning in Hand! I’m Tony Vincent and this is the show where I share tips, how-tos, and ideas for using today’s digital tools for teaching and learning. Episode 29: Free Images for Your Projects, recorded September 2014, happens now! If you’re creating a digital project, chances are you will want to use images. I think the best images are ones you photograph or create yourself. Then you know your work is original and that you have permission to use them. But there are times when you don’t have the time, talent, or resources to photograph or make your own. That’s when you’ll turn to the internet to use images photographed or taken by someone else. You should not steal any images you find online. You need permission from the copyright holder. I’d like to tell you about three websites that are great for finding clipart, photos, and icons. These sites feature images that you already have permission to use on your website, blog, poster, slideshow, video, animation, etc., etc. First, let me tell you about Openclipart. 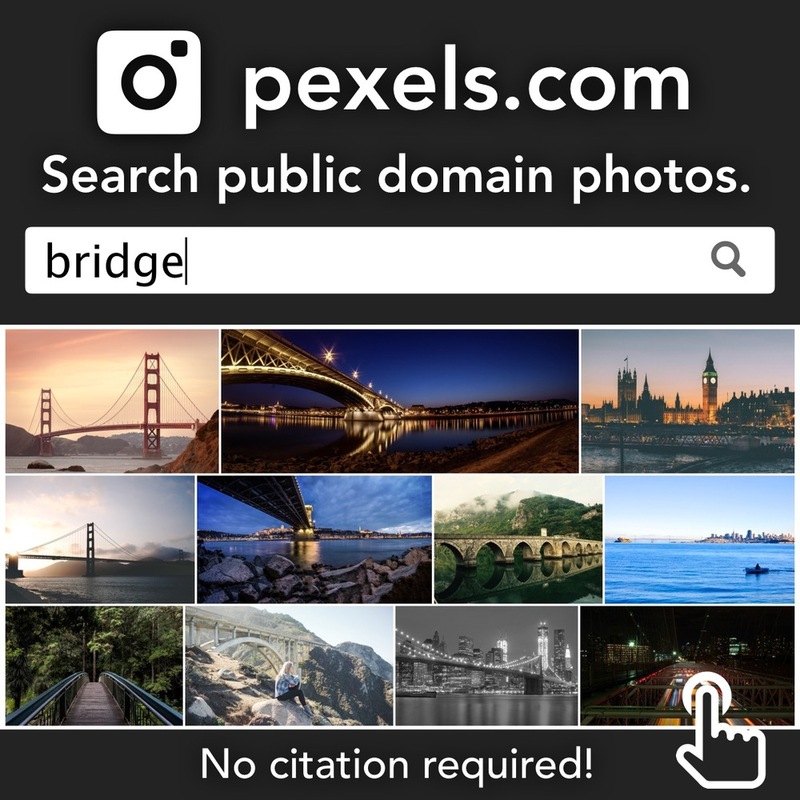 You can search thousands of images and use any of them for free. Every single image is public domain, so they don’t even require you to give attribution. Though, it still could be a good idea to label public domain images you use as public domain so that others know you did not steal it. Openclipart may be used free, without restriction for any purpose for commercial and non-commericail reasons. Openclipart has a chart that explains if you are permitted to use images you find for various uses. It turns out, you can use Openclipart for any and all uses because all images have been released into the public domain. 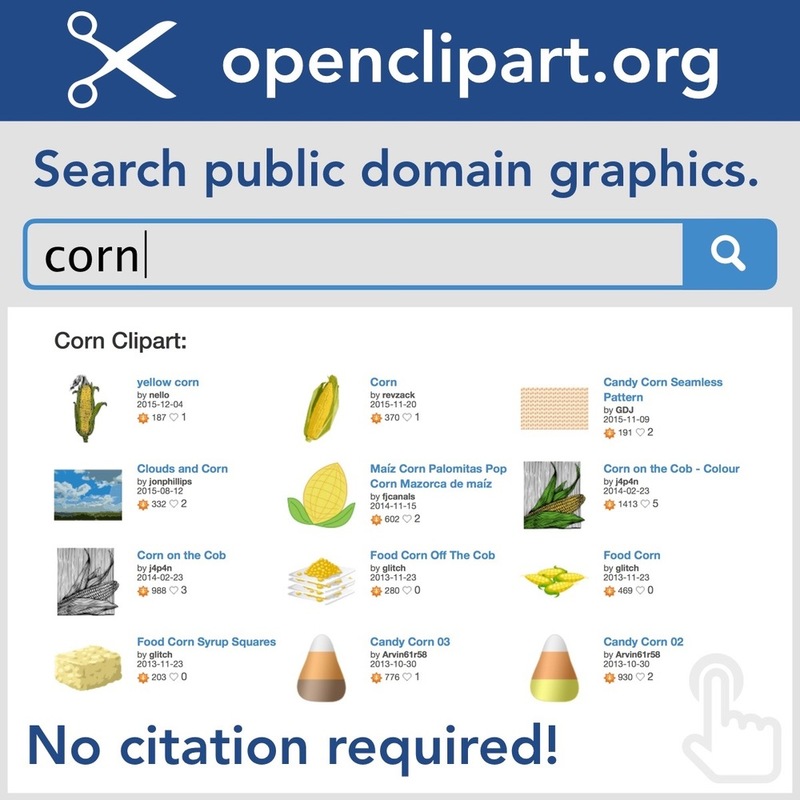 You can easily search Openclipart. Let’s search for the word search. There are 8 pages of results. While you could save the small thumbnail image, chances are it will look blurry in your project. It’s better to download a large image that you can shrink than to use a small image and try to make it larger. So, I click the thumbnail of the image I want to use in my project. Now I can see a larger version. This isn’t a bad size, and I could save or copy this image. But instead, let’s get an even larger image by clicking the PNG button. PNG is a great format for clipart because most of time the images have transparent backgrounds, which means there’s not a potentially ugly white box around the image when you use it in a project. There are a variety of ways to save an image. If you’re on Windows or Mac, you can right click to save the image. On a Chromebook, tap the mousepad with two fingers. On iOS and Android press and hold the image. The second free image repository I want to tell you about is Pixabay. It has clipart and photographs. 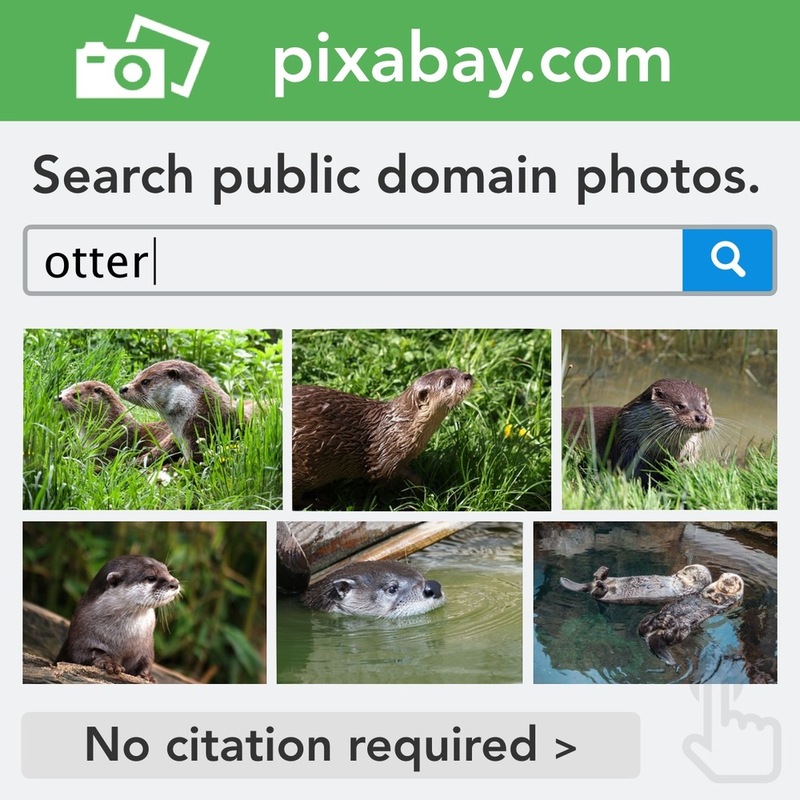 Just like Openclipart, images on Pixabay are all published as public domain. You can copy, modify, and distribute these images, all without asking permission and without giving attribution. Pixabay’s search box has some options to help you find what you are looking for. You can even filter your search to a specific category like animals, people, education, and emotions. You’ll probably see images that look great and might be perfect for your project at the top of the results. If you look closely you’ll see that these are sponsored images. Sponsored images link to Shutterstock. Shutterstock’s images are not public domain. They cost money. So when using Pixabay, train your eyes you ignore those beautiful sponsored images. Click an image you’d like to download. You can save the image on this page, but you can get higher resolution photos by selecting a size on the right side of the screen and clicking Download. You’ll have to complete a captcha before the download can start. If you don’t want the frustration of a captcha for each download, you can sign up for a free account. You can even use your Google account to sign up. 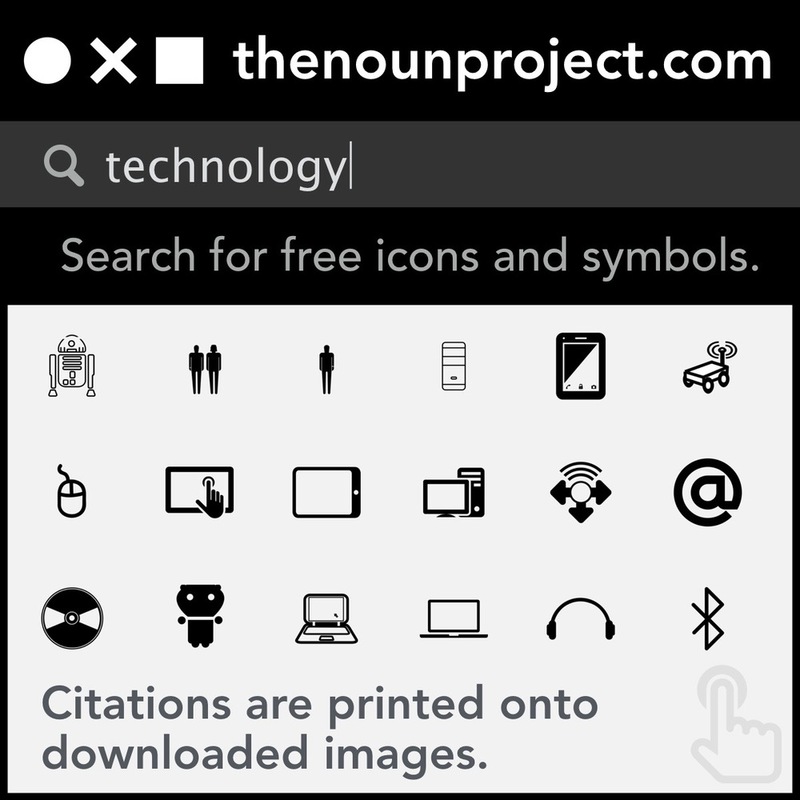 The third library of free images I’m excited to show you is The Noun Project. The Noun Project is filled with simple icons and symbols. Some of those icons and symbols are licensed as public domain. Most of them are licensed under Creative Commons – Attribution. You are free to use these images, but you must give credit to the designer. The Noun Project makes it clear who to credit. You can copy their wording to include as credits in your project. Saving images from The Noun Project is a little more complicated than saving from Openclipart and Pixabay. Like Openclipart and Pixbay, you enter your search and click one of thumbnail results. You cannot download the image on this details page. The Noun Project has programmed their site so that you have to log in before you can copy or download their images. You can sign up with a Facebook account or with an email address. After logging in you can click the Download button. You can choose to buy the image. If you purchase it, you don’t have to worry about attribution requirements. To use the image for free, you’ll have to agree to credit the designer. After you agree, your download begins. When asked what format to choose, select PNG. And a little hint if you’d rather have white or grey icons or symbols.. In an image editing app, turn up the exposure and decrease the contrast. You can adjust brightness and contract using Pixlr. There are free versions for the web, Android, Chrome, Fire, iOS, Mac, and Windows. Read my directions for how to recolor images from The Noun Project. It takes a few steps, but you can indeed change them to any color you'd like. So, yes, The Noun Project’s icons and symbols take several steps to access, but I think they’re worth it. The images are highly recognizable, helping you communicate your ideas. In projects, keep in mind there is a difference between illustrations and decorations. The best projects have visuals that illustrate ideas presented. Images that illustrate show, explain, or serve as an example. I’ve been using images in this video to illustrate what I’m talking about. Images that decorate are added as an extra element that might fill up space and make it look pretty, but do not help explain the ideas you’re trying to convey. This kitten is super cute, but she’s a decoration because I’m filling up space with a photo that doesn’t have to do with the ideas I’m talking about. Yes, Openclipart, Pixabay and The Noun Project are massive libraries of images. But they don’t have images of everything. Oftentimes you’ll need to try using different keywords to improve your image search results. If you’re not happy with your initial search results, reword with synonyms or think of other things you can search for. Search for actions that demonstrate what you want to illustrate. Search for objects, people, or animals that are associated with what you want to illustrate. Search for locations where what you want to illustrate occurs. classroom. If you’re like me, you’ve spent a lot of time looking for just the right image to illustrate an idea. Instead of using Google to find images that I may not have permission to use, I tend to stick with using Openclipart, Pixabay, and The Noun Project to find free and copyright-friendly clip art, images, icons, and symbols. That’s it for Episode 29. I’d love for you to like Learning in Hand on Facebook, and follow me on Twitter And, of course, I highly recommend that head on over to my website, learninginhand.com. Bonus: Create surprising and fun images at PhotoFunia. Simply upload an image and have it "photoshopped" into billboards, frames, and more.